My name is Max Starkenburg. I'm a web professional from the US, currently based in Bremerton, Washington Houston, Texas Rancagua, Chile Mexico City Washington, DC. While my academic background is in architecture, all of my professional career, including summer jobs beginning in 1999, has focused on web work. More details in my résumé. 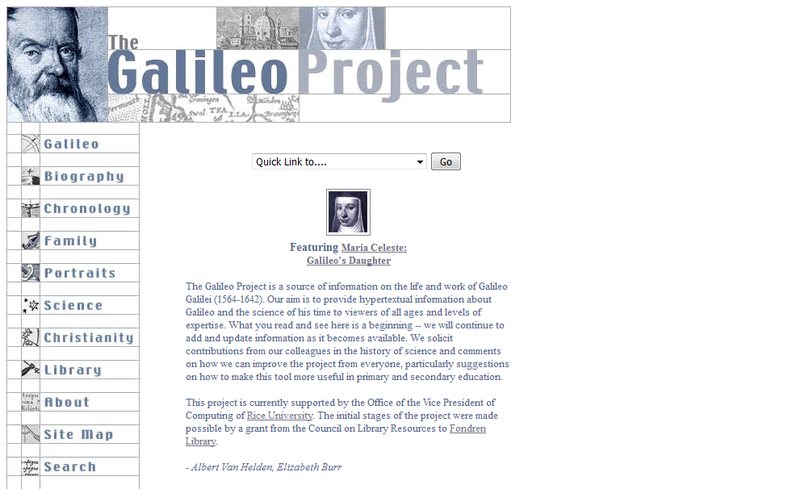 Learn more about how I made this website in the colophon. Feel free to contact me using this form, or just writing to max@maxwell.fyi. ¡Hola! I'm Max. I make web interfaces and live in Washington, DC. Learn more about me. 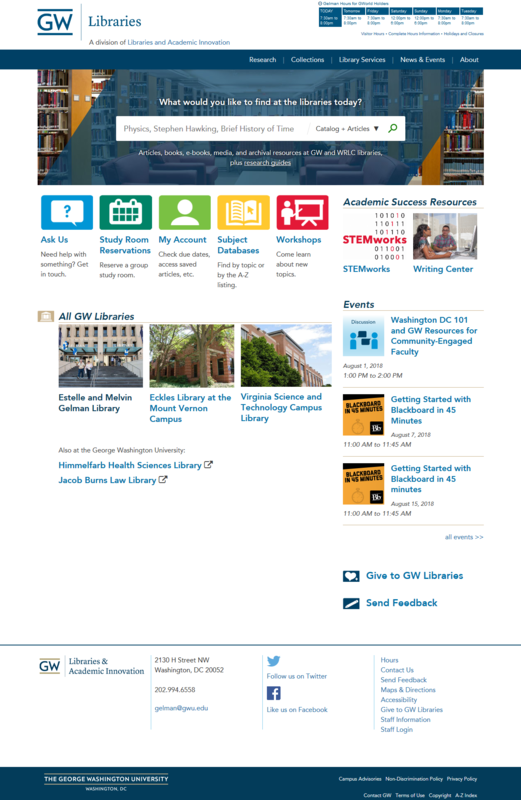 In my latest work, I've been involved the creation and design or redesign of several Drupal-based web presences for George Washington University Libraries & Academic Innovation. These show some of what I've worked on at GW. 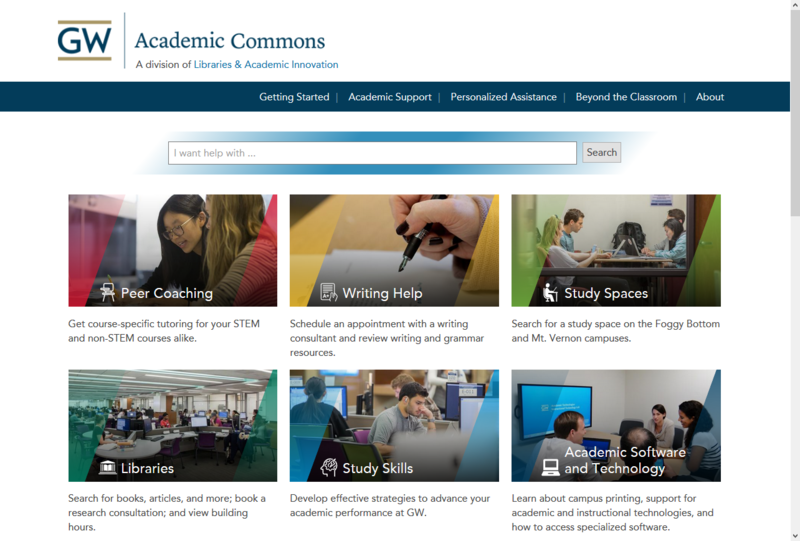 Responding to a need to provide a central hub that connects students to the variety of available but disconnected academic services and resources, the Academic Commons was created. 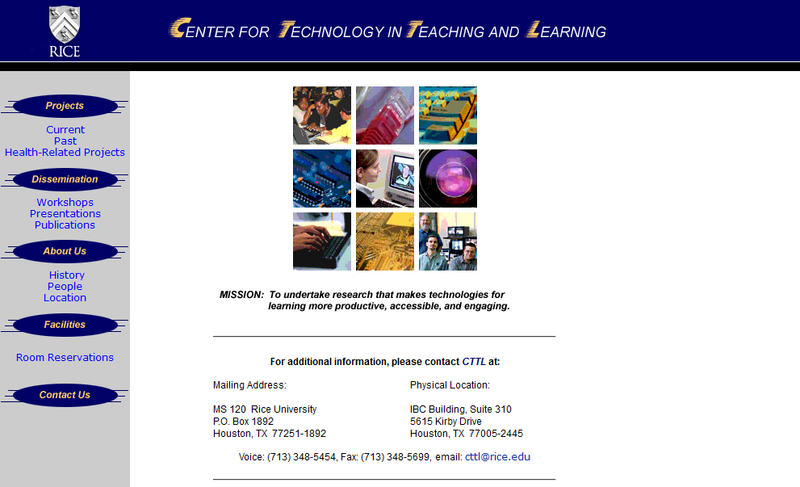 The homepage was intended to provide an at-a-glance overview of the variety of services and resources available to students, with easy and direct points of entry to learn more. 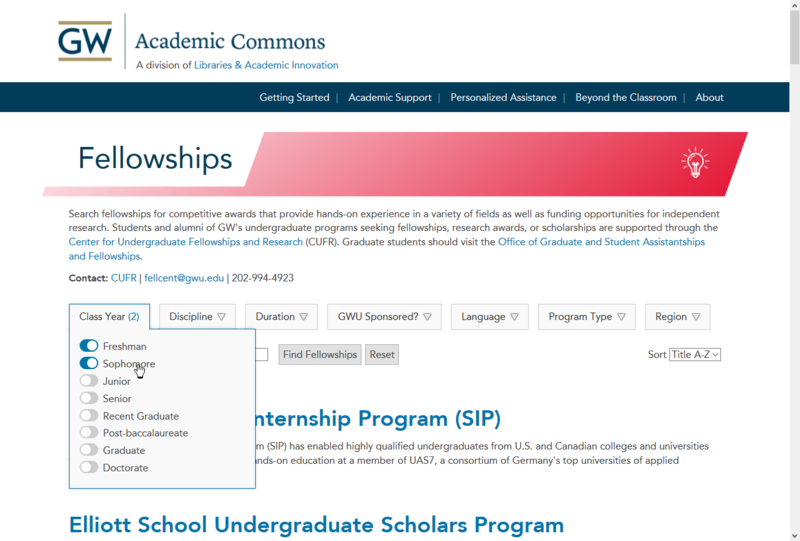 Fellowship discovery is guided by many filter and search possibilities designed to fit compactly above the result list while clearly communicating which filters have been applied. 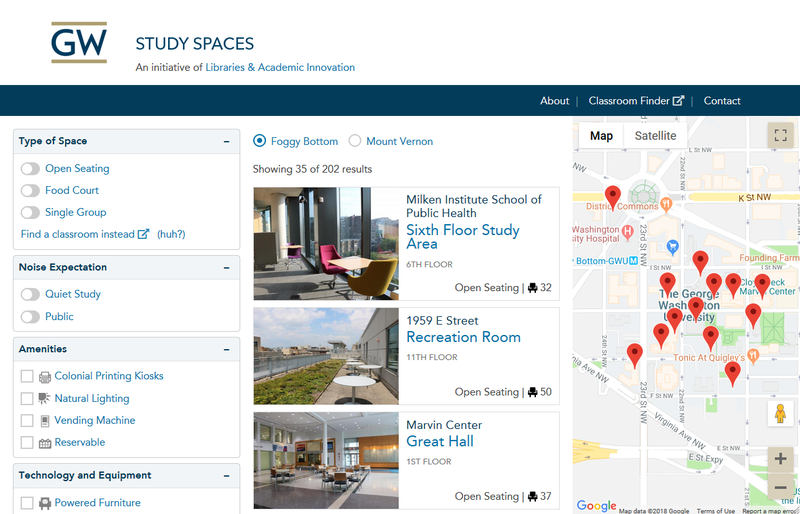 Allowing students to find study spaces all over GW campuses, our department built this website, using it as an opportunity to start getting our hands dirty with Drupal 8. 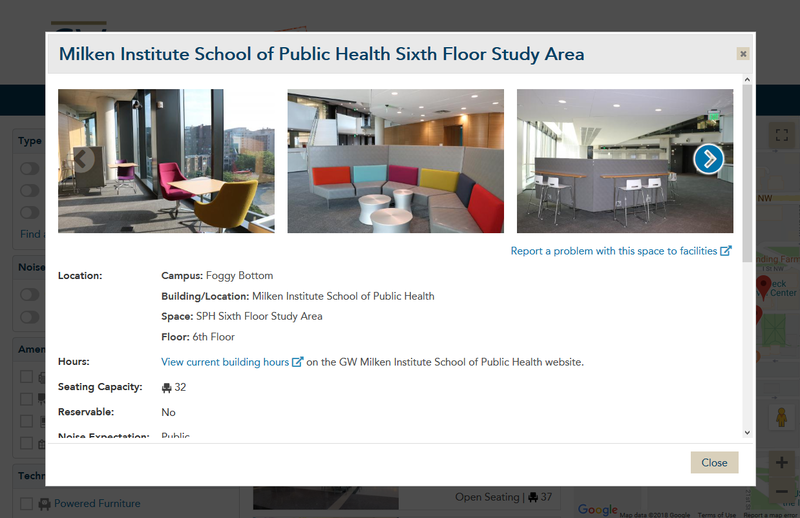 A screenshot of the homepage, balancing the needs of university branding, filtering options that show variety without overwhelming, enough space information to want to click to see more, and the map of locations. 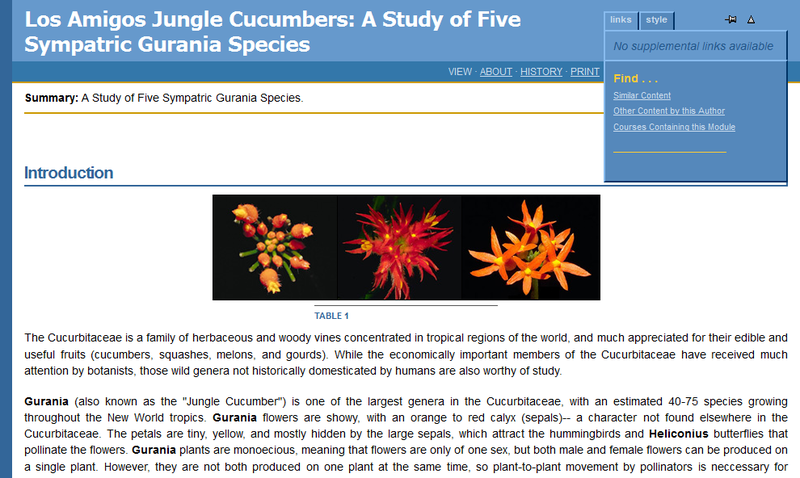 An example of the fuller set of information and relevant images and links one sees after clicking on the teaser of an individual space. 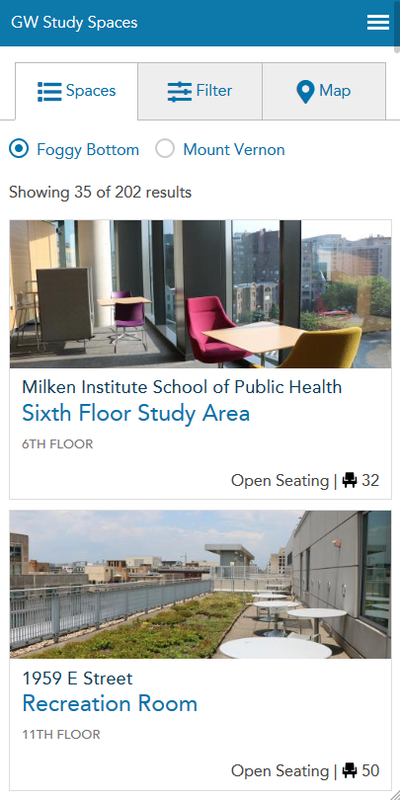 The mobile view was strategically designed to emphasize the most important aspect of the site (the list of study spaces) while also providing easy ways to access all the other necessary features and ensure that pre-selected default options like campus weren't tucked away. 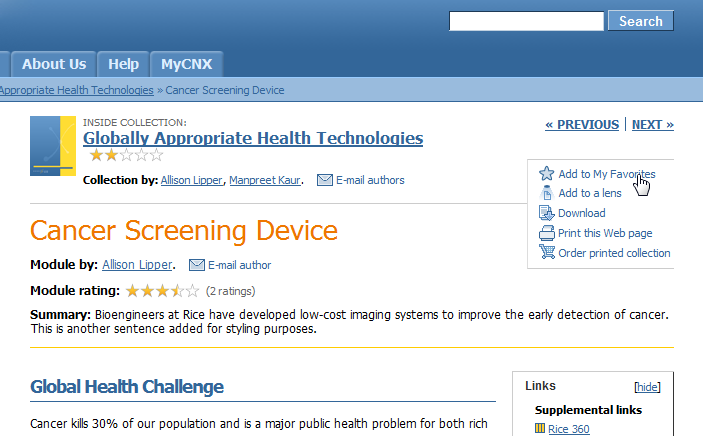 The design of the filtering interface was the subject of many usability tests to assure optimal decisions were made around the necessity of specific options and categories, their semantic clarity, their order, and their behavior. 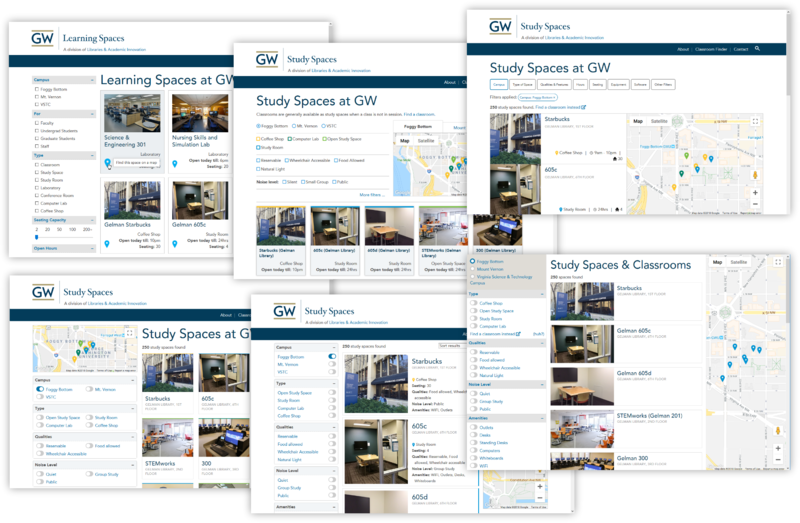 Conflicting needs and desires of students and other stakeholders were represented in mock-ups (some seen here) that could be used to verify their plausibility when presented with realistic interfaces showing different options. 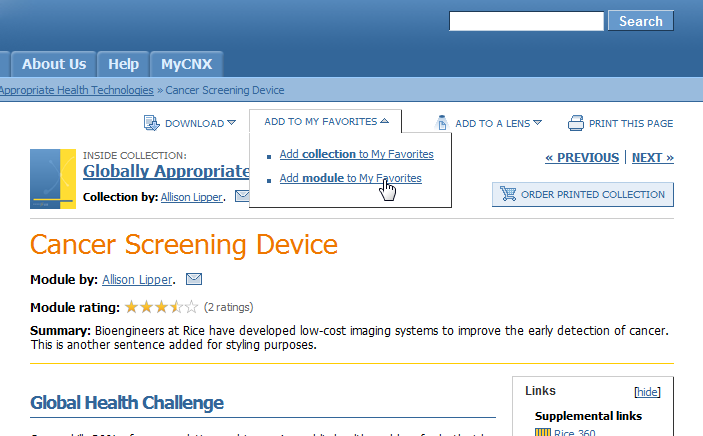 The new design led to an increase in new catalog searches. The older design was very text-heavy and busy. 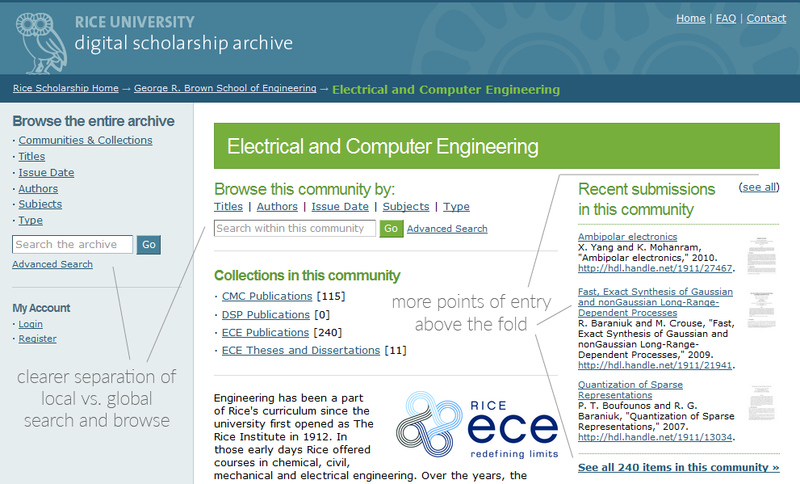 The new design returned focus to the essential search feature of the site. 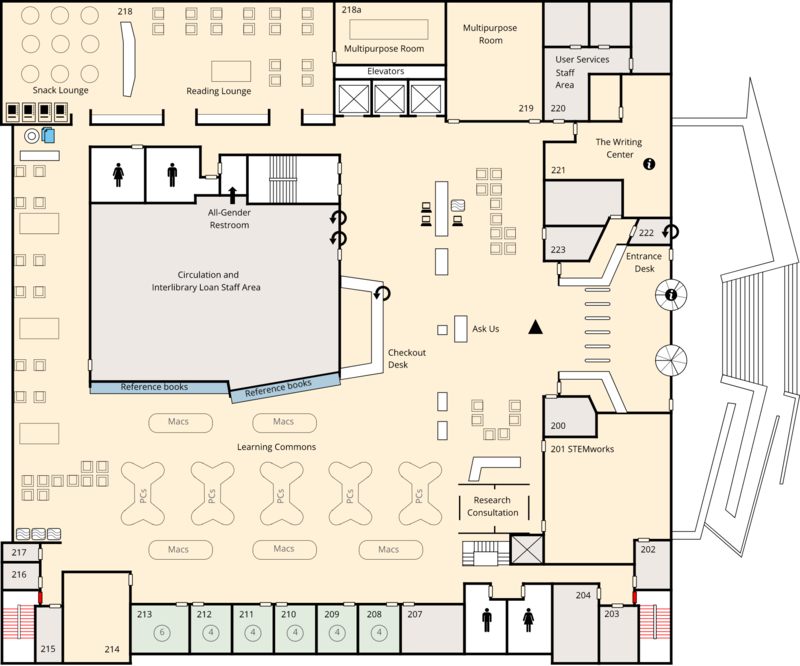 In addition to being able to mouse over the maps and have information about buildling features appear, the maps were built to allow for users to click a link next to the call number in the catalog and be directed to exactly where in the building their book is located. 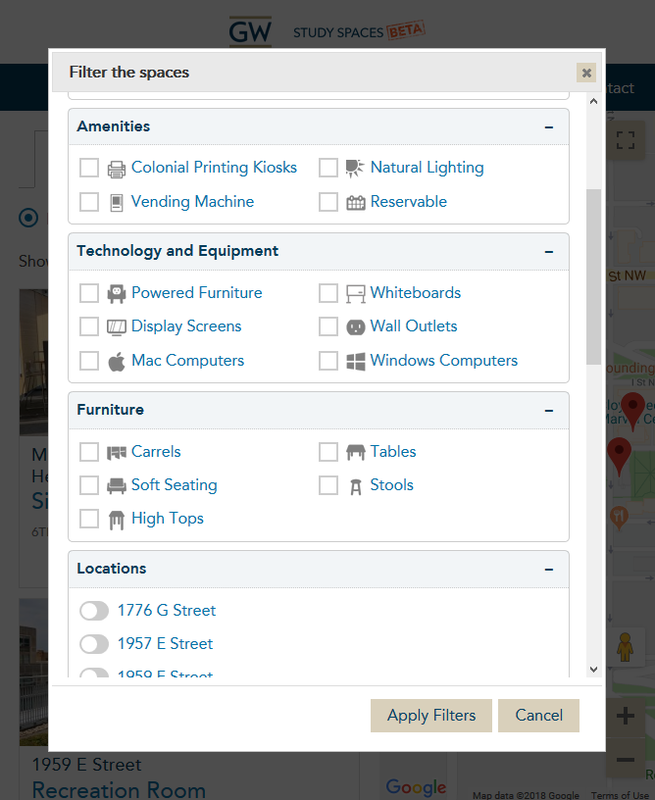 The interactivity of the maps extends beyond simple mouseovers to the ability for any catalog call number to be represented correctly in the maps' stacks. 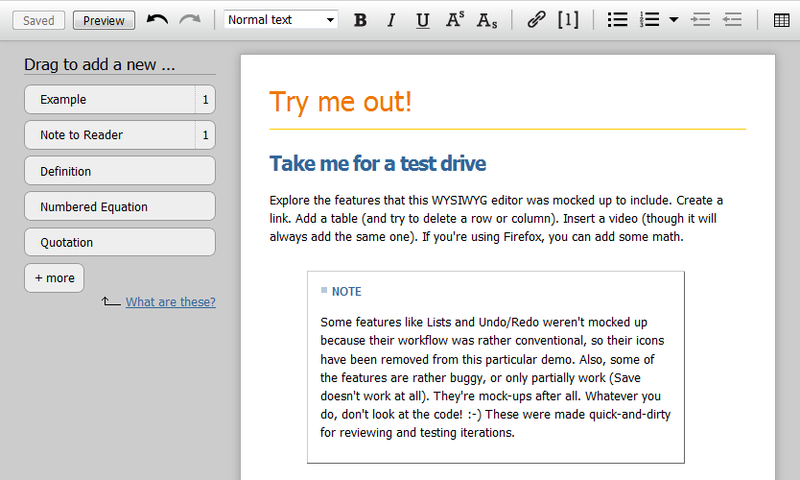 I made functional mock-ups of a web-based WYSIWYG editor (a WYSI-what?) from scratch, which guided the software development and were used for all usability studies (I'm proud to say that some subjects were surprised they weren't the real thing). Each component had multiple technical and UI "moving parts" to juggle (drag-and-drop, handling Range/Selection of contentEditable text, contextual help, menus for advanced options, "nudging" features, redundant workflow expectations, etc.). Below is a sample of some of the interfaces, each of which went through various iterations. The math mini-editor allows authors to see the results of their ASCIIMath mark-up as they type. A "cheat sheet" helps with understanding or remembering the ASCIIMath mark-up. 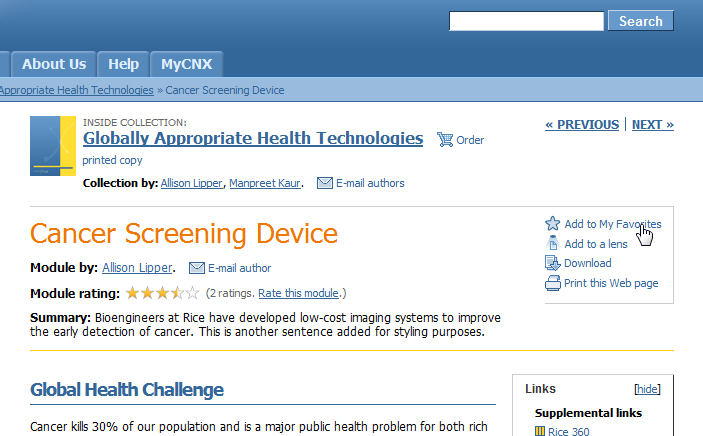 An important aspect of the editor was nudging authors to include text for the benefit of users who rely on screen readers, as well as to provide attribution for the image's creator. Both of these aspects were tightly woven into the workflow. 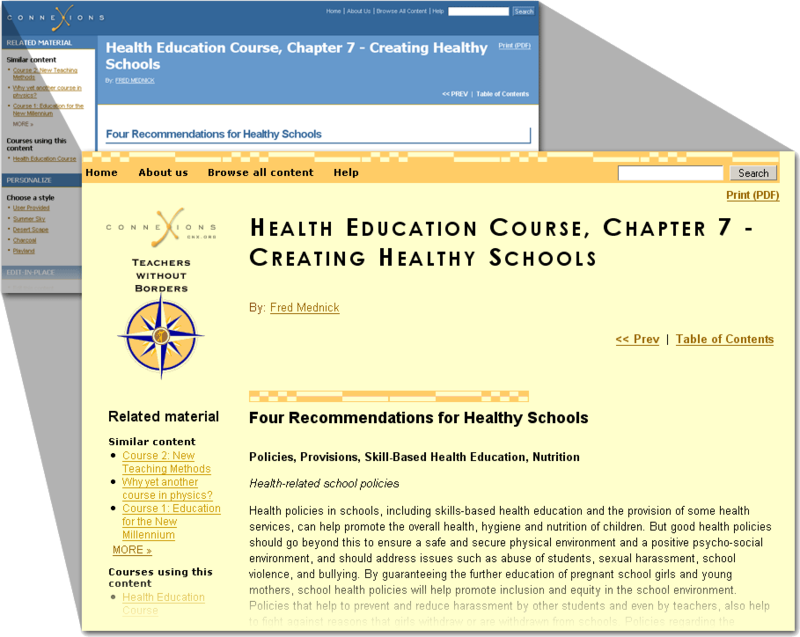 A key question of the editor was how to add semantic elements like Examples, Exercises, Notes, Equations, etc., that would not just share a respective format, but provide features like automated numbering, automated index generation, answer sets, and collated glossaries. 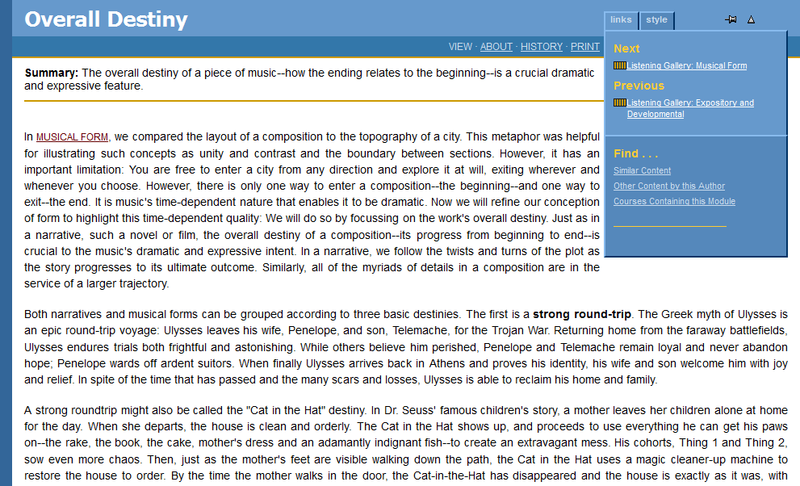 These animations show three different ways an author could add a Definition to their text. 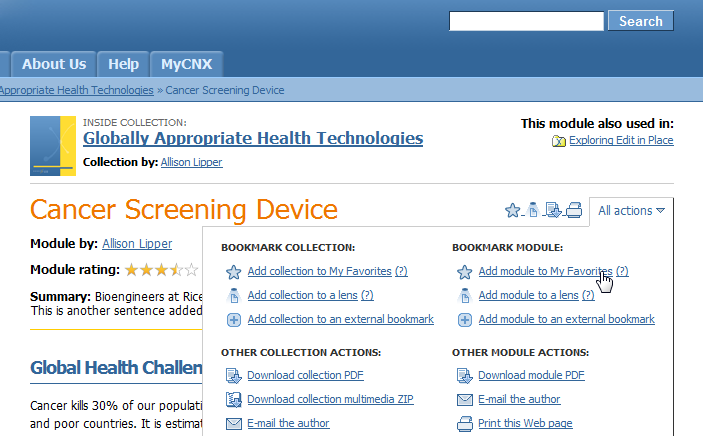 Subtleties of their functionality were the subject of multiple usability studies. Read a report of one here (PDF). 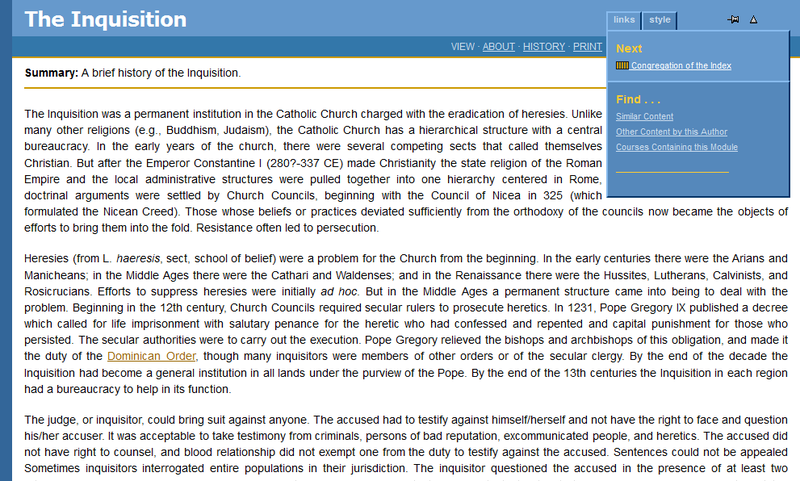 After adding Definitions to the text, they could automatically link to an entry in the Glossary. 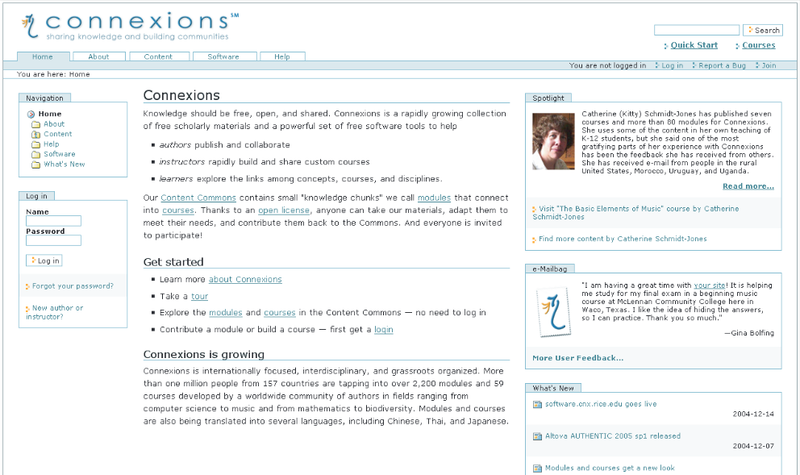 I was the lead visual designer at Connexions (now OpenStax CNX) for over 10 years. Aside from setting general graphic guidelines, I worked on mocking up ideas for every new feature that involved the user interface. 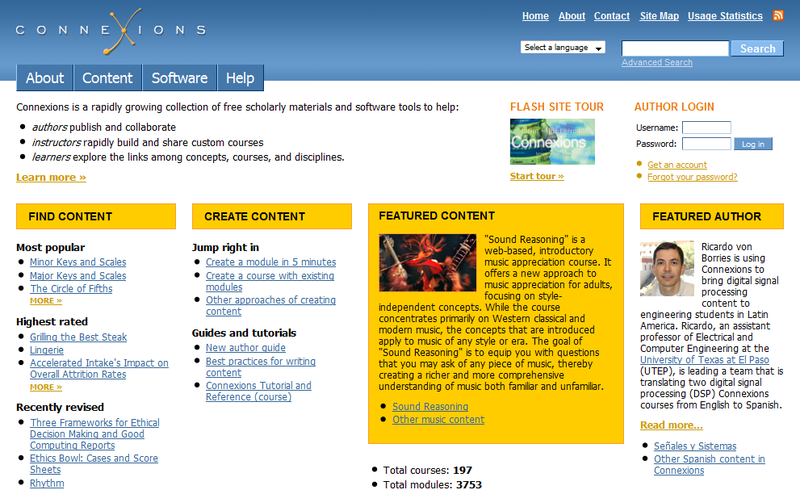 The original design was little more than the default styling of the underlying CMS. Some colors and other basic styling gave it some new life, but not enough. 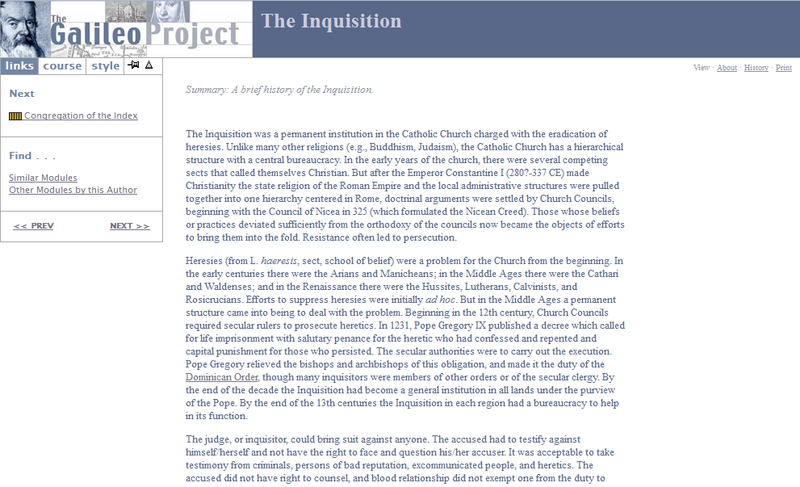 This design featured several of the new elements desired (ways to jump directly into the content, a shorter introductory text), but had balance issues. This design attempted a more clean and neutral look, but in the end had the same flatness issues that the default CMS style had. 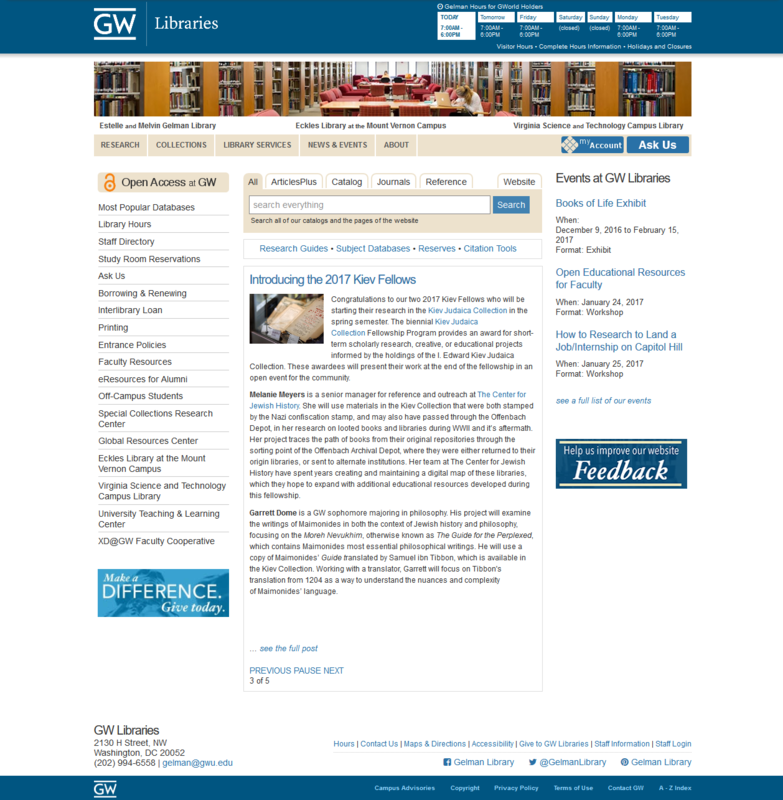 While this design had better balance in terms of focusing where to look, the "Find Content" section was overwhelming, and the introductory text felt oddly placed. While this design solved some of the issues of the previous iteration, it created others. The final design best balanced the desired features, given the constraints of the task. 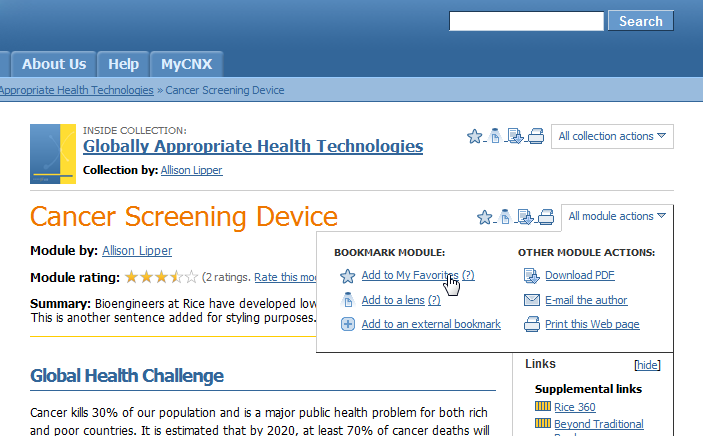 How to add options on a webpage to download its PDF, download its ZIP, add it to various bookmarks, send it to the printer, order a printed copy, rate it, e-mail its authors, edit it, all for two levels of content (the current page and its container)? All while making such options compact, easy to access and understand, and flexible for future features? These are just a small fraction of the ideas mocked up to tackle such a challenge. Icons plus a "more" link for each level of content. All actions for both levels behind a single link. Printed copy action pulled outside as a button, and e-mail icons moved next to author names. 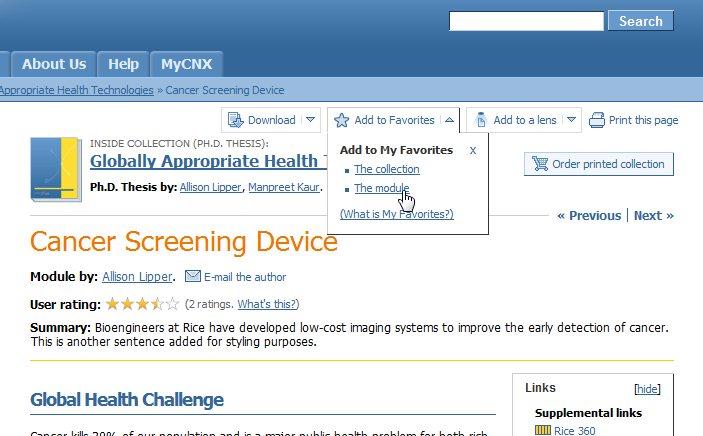 A different styling, with the printed copy action as a shopping cart icon. Actions in a flyout from the breadcrumbs level. Actions at the top, with individual flyouts. Actions located ambiguously between the two levels of content. 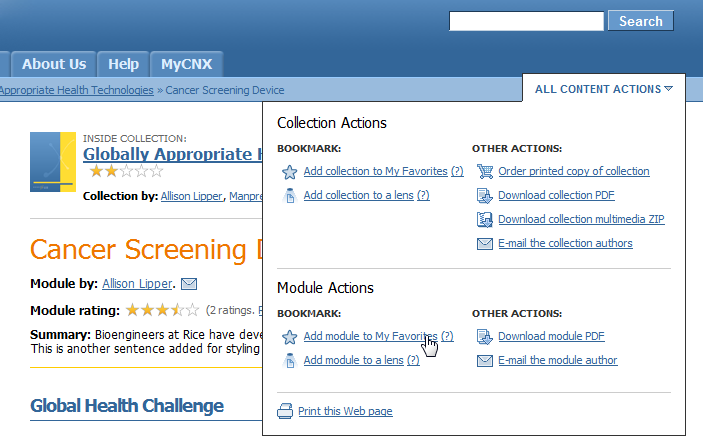 Actions between the two levels of content, with "plus" icons to indicate more options under each icon. Experimenting with how to refer to the different levels of content within the dropdown, as well as a new printed copy button style. 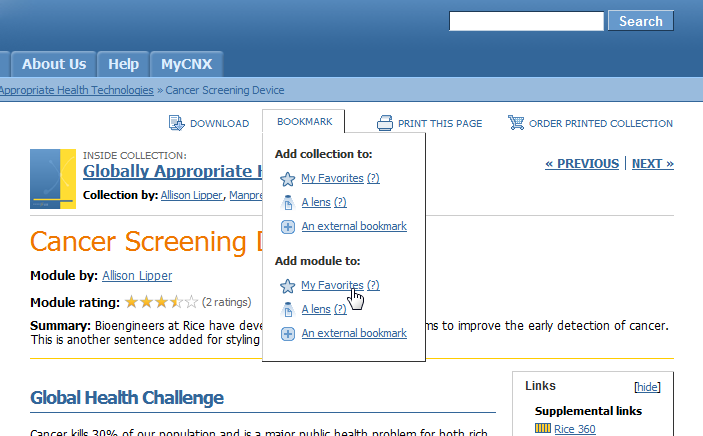 Another way of referring to the different levels of content within the dropdown. Moving more actions into a single "Add to ..." dropdown in order to narrow the row, as well as a different styling for the dropdown. 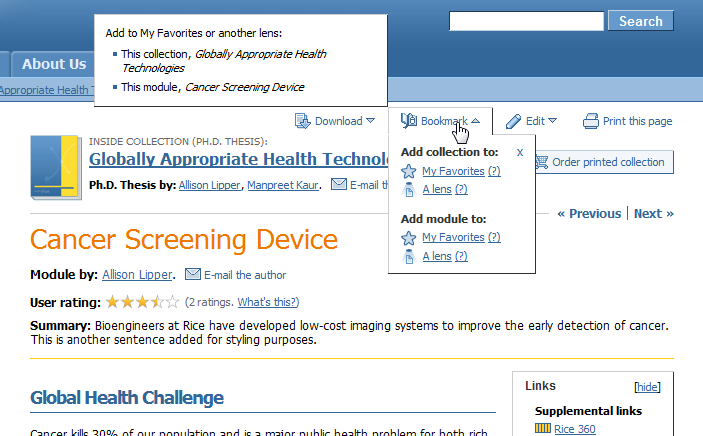 Another experiment with how to refer to different levels of content within the dropdown. 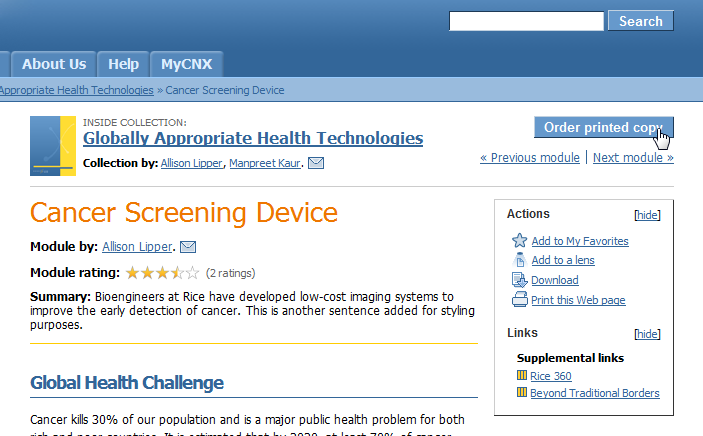 Contextual help to assist with defining what is meant by the two levels of content. 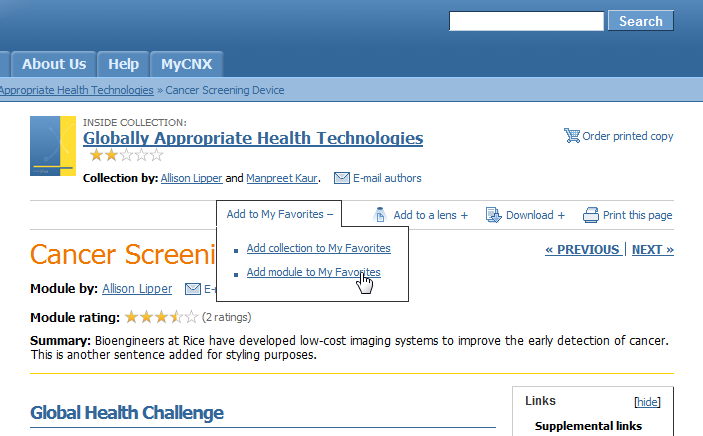 "Favorites" as a top-level menu item. 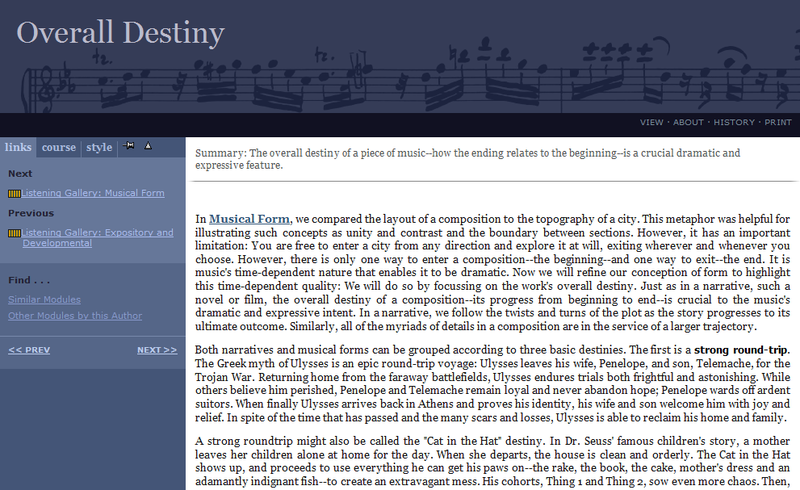 The final agreed-upon design, as shown before one adds content to one's Favorites. 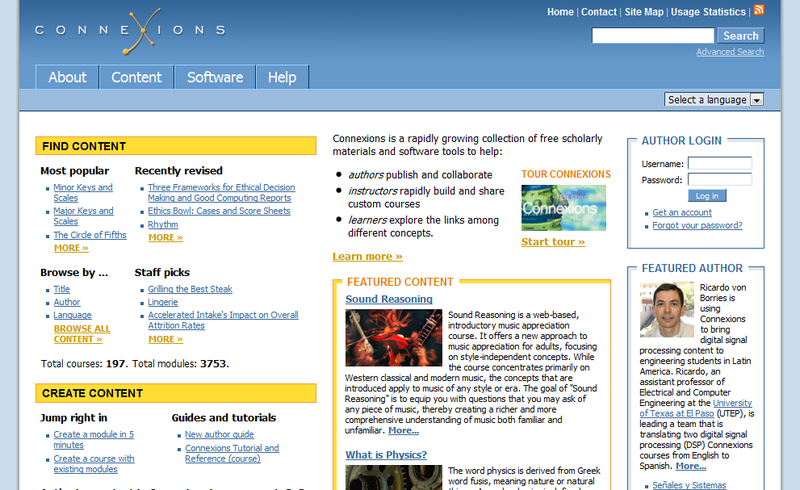 The final agreed-upon design, as shown after one adds content to one's Favorites. 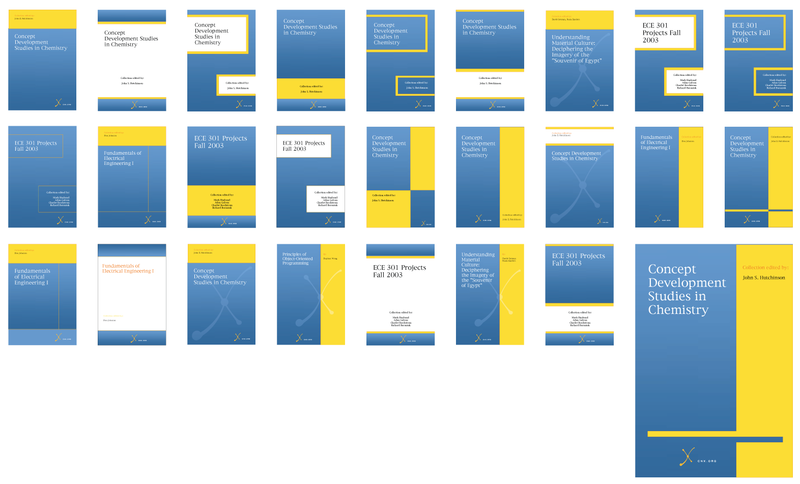 The brief: to design a cover that could be generic enough for any type of content, be flexible enough to allow long titles and long lists of authors, be branded to Connexions, and be visually interesting. 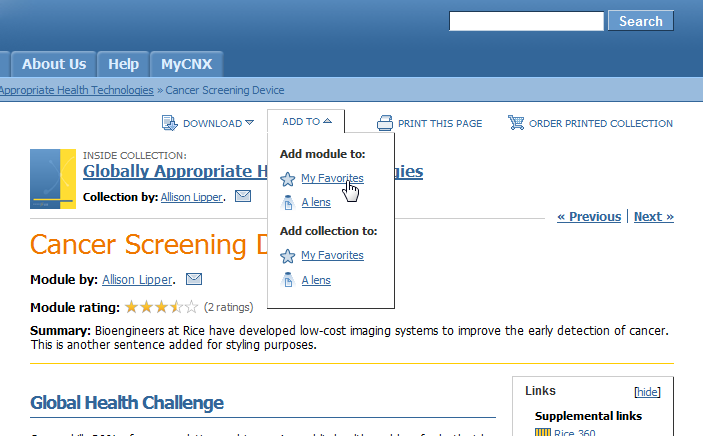 Like most of my other work at Connexions, I played with a variety of layouts before a final choice was decided by a larger team with my input. Many drafts were made for a design intended to be flexible for varied text while aesthetically pleasing. Much of my work has focused on completely changing the look and feel of a website while leaving the underlying architecture relatively intact. 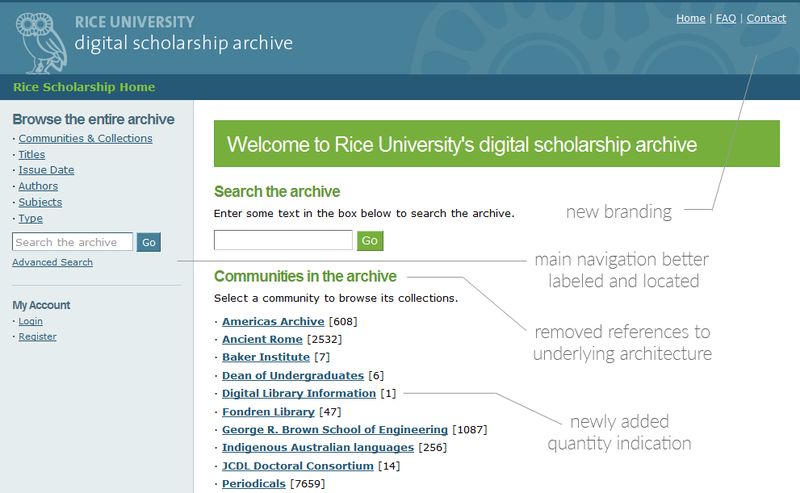 How Rice's Digital Scholarship archive looked with some minimal styling and the basic DSpace installation. 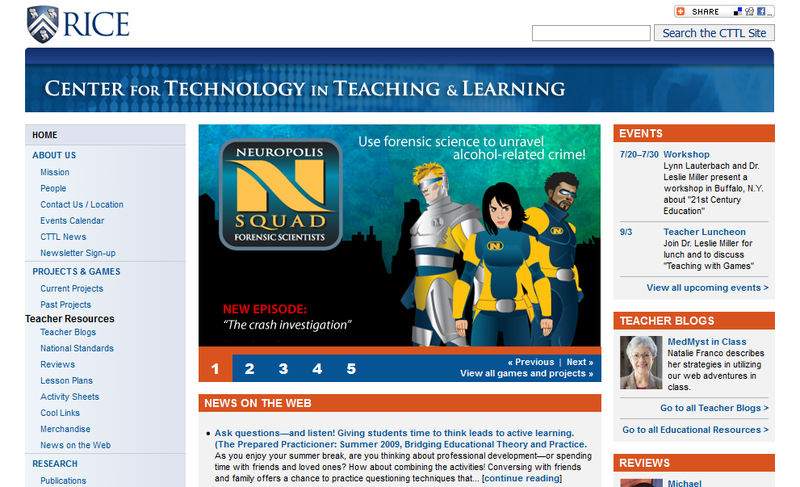 Redesigned not just for more distinctive branding but for better functionality as well. 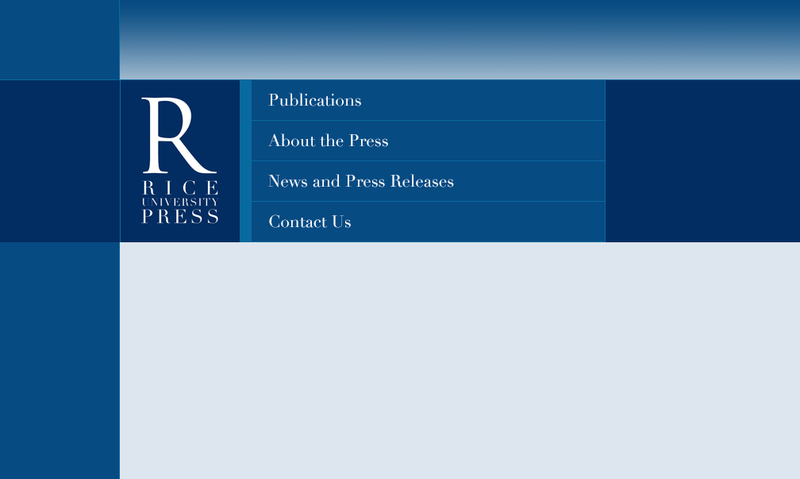 Aside from changes to color and branding, I used XSLT stylesheet changes to reposition elements and remove references to the internal technology, to create a more intuitive user experience. ... 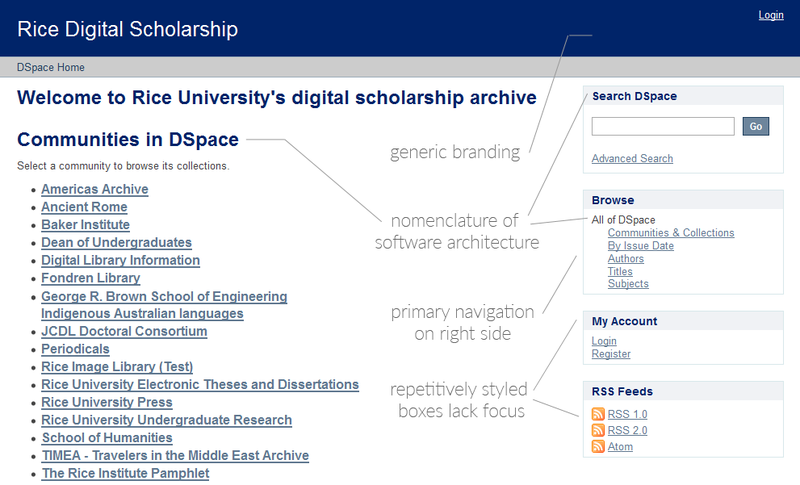 In addition to primary navigation being in a problematic location, there were many references to the underlying architecture (DSpace), as well as navigational elements relying solely on nomenclature. I sought to improve these issues with increased contextual clues and to make better use of "above the fold" vertical space. Each layer into the site required more adjustments and features to take into account. Previously, the local Search box was lost below the fold, and it wasn't clear what aspect of the site the various Browse options referred to. 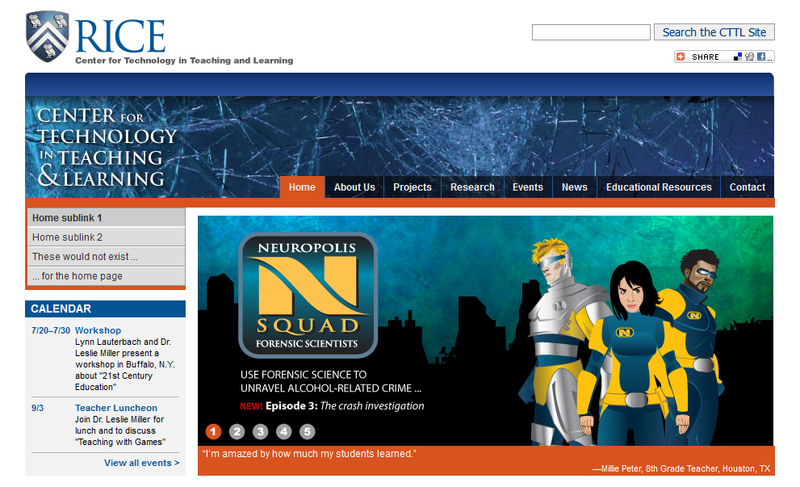 A screenshot of the project's homepage, showing their style. This is how the external project's text displayed using the basic/default style of Connexions. 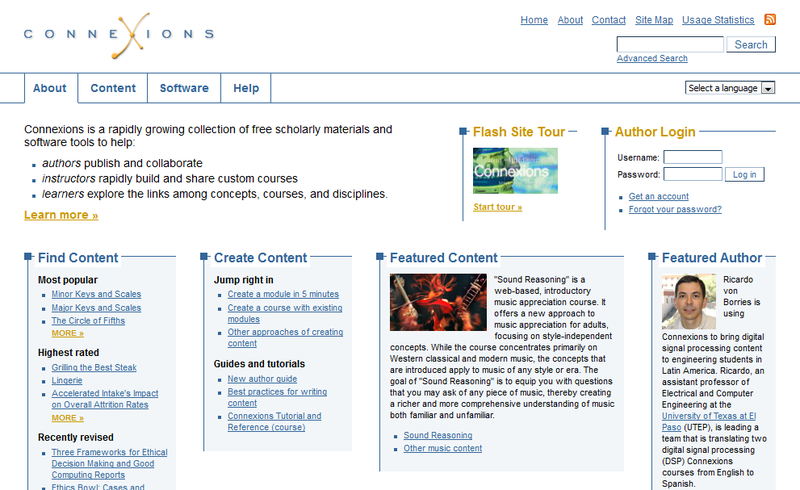 The project in Connexions, but using a custom stylesheet, with no changes to the HTML mark-up necessary. ... 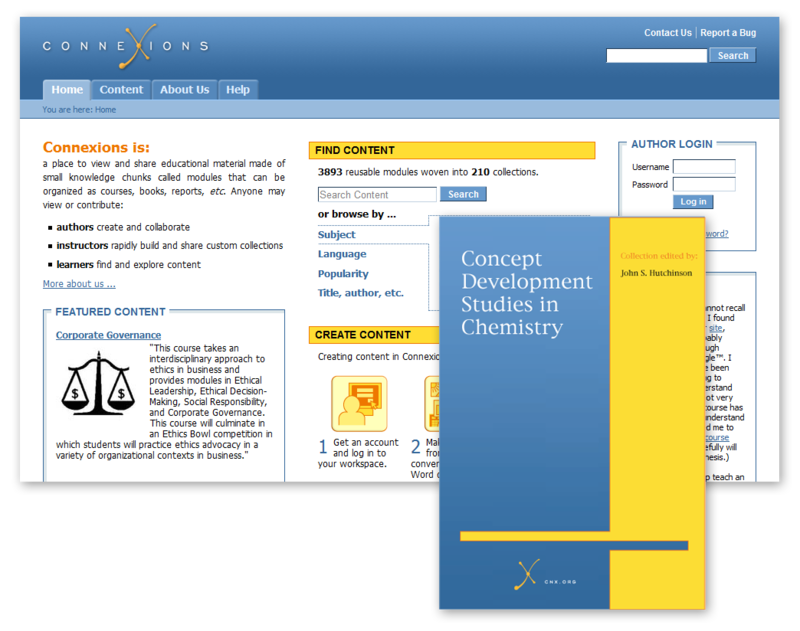 While in many cases maintaining these stylesheets proved prohibitive, they were frequently a contributing factor in adopting usage of the Connexions repository. 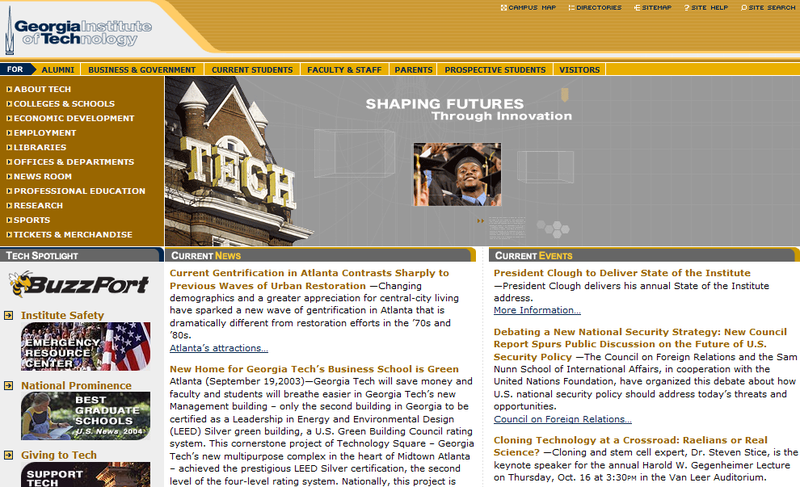 This is how the organization's own website looked at the time. 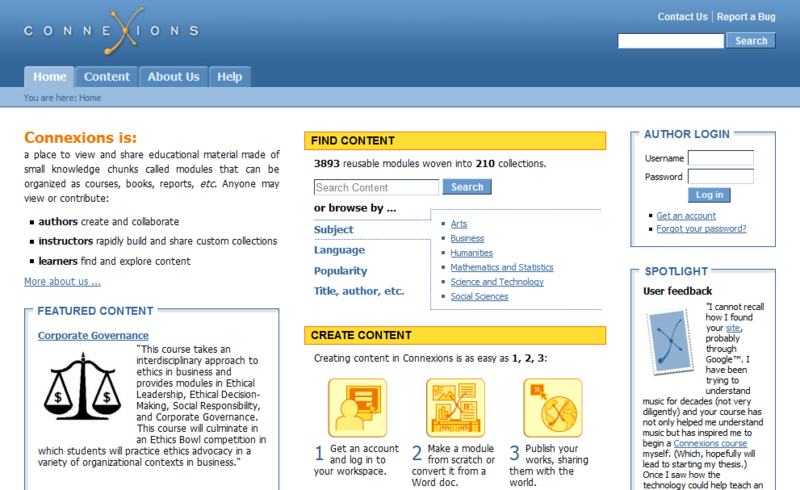 This is how the organization's content was displayed in Connexions using the then default Connexions style. Using only CSS, their content in Connexions could be displayed to match the styling of their website, allowing for linking between their website and our publishing platform, with a seamless continuation of look-and-feel. 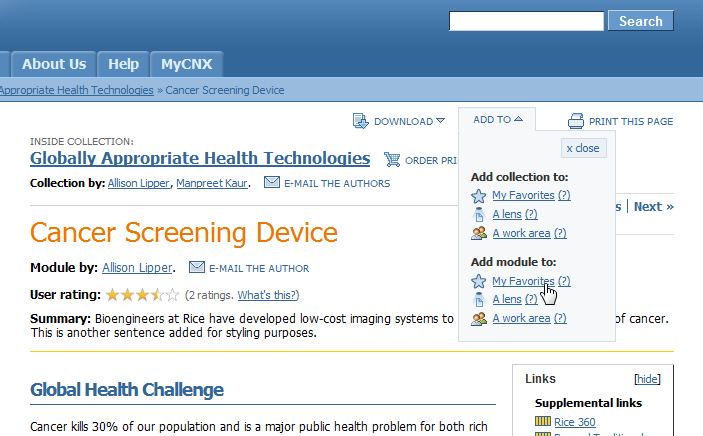 In addition to matching external groups' styles, I also created stylesheets just for user preference or internal use. The biggest challenge they presented was making them flexible enough to work with a great variety of user-entered content. No dimensions of content could be taken for granted. 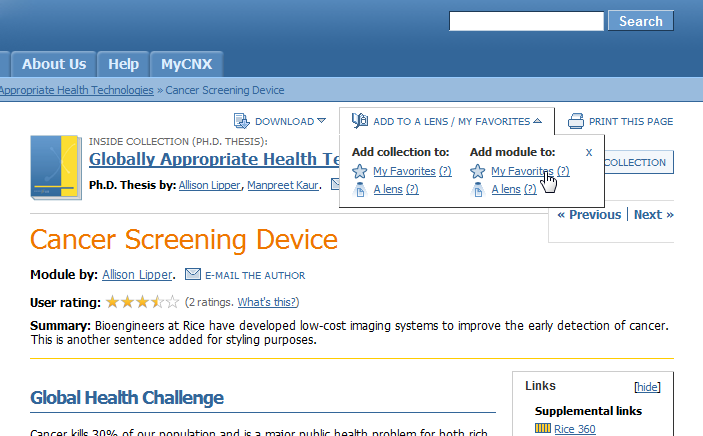 This is how the content displayed using the basic/default style of Connexions. 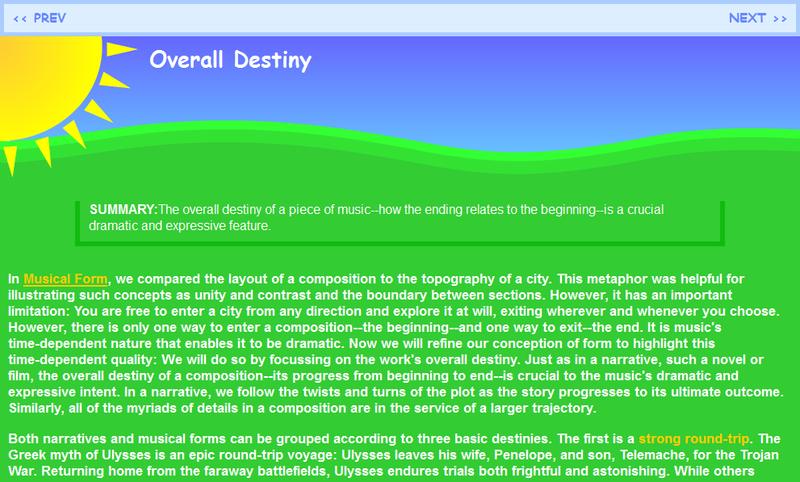 An entirely different styling from the default, intended to highlight the music content on the site. A stylesheet that could be applied to content for young children. 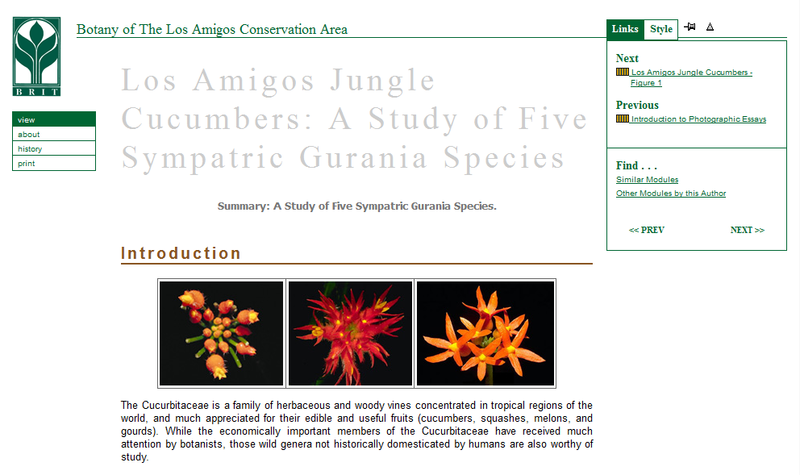 A few of the examples of small-scale basic websites, some completely from scratch, I have designed over the years. 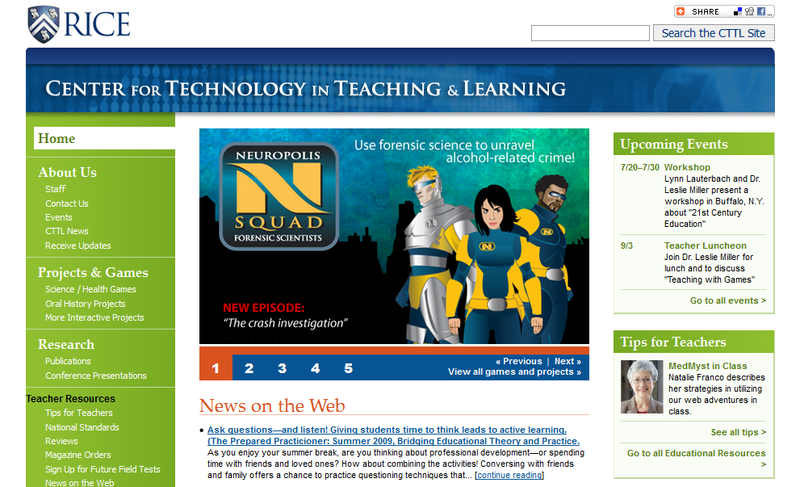 The WYSIWYG editor project I worked on needed a front page to show off what it was about. There was an existing WordPress site, but it was the default style and lacked the right structure for new visitors and potential collaborators. With installation help from developer Marvin Reimer, in a few days I did a complete rehaul of the style, designed a new logo, installed new plug-ins, and populated the content, giving the site new life. The makeover incorporated various point of entry, and a new design based on the original logo I created, while incorporating outside photography and WordPress plug-ins for a truly collaborative effort. 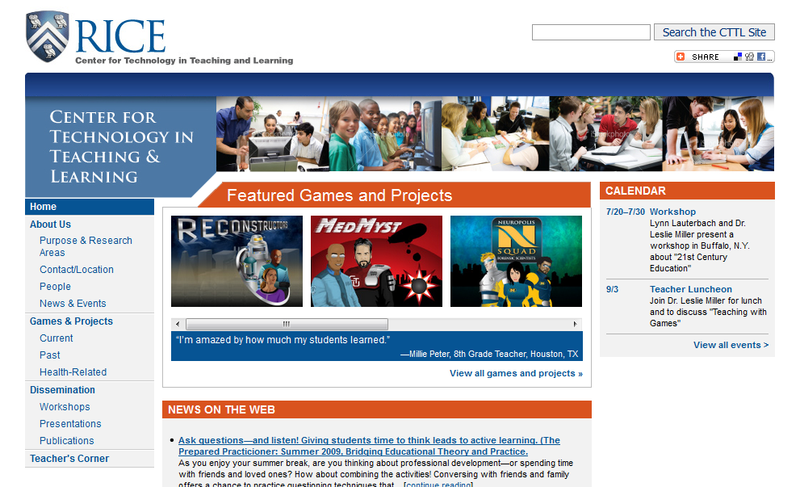 CTTL, a Rice University center that designs interactive games for young students, sought to give their website new life and to meet Rice's guidelines for branding of its sub-pages, while also maintaining a distinct look and feel. The redesign, done in collaboration with Francisco Perez, started with a card sorting session, and ended with training the staff to update the content we had populated into the new CMS. 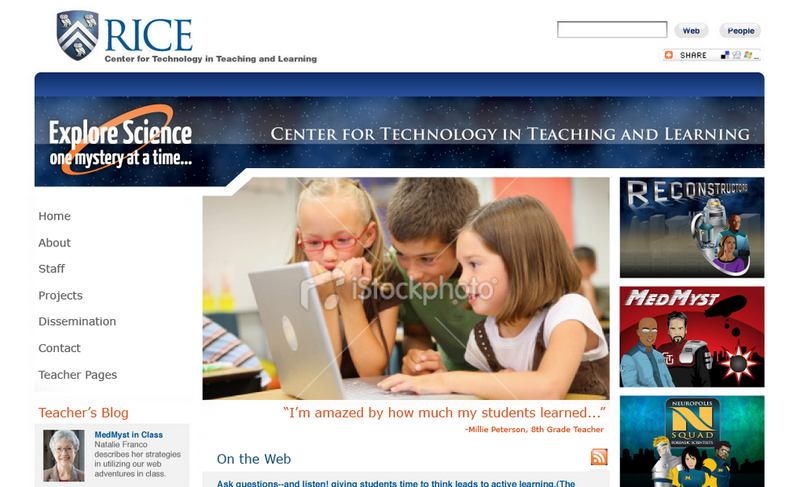 The site design went through several iterations before arriving at its final design. 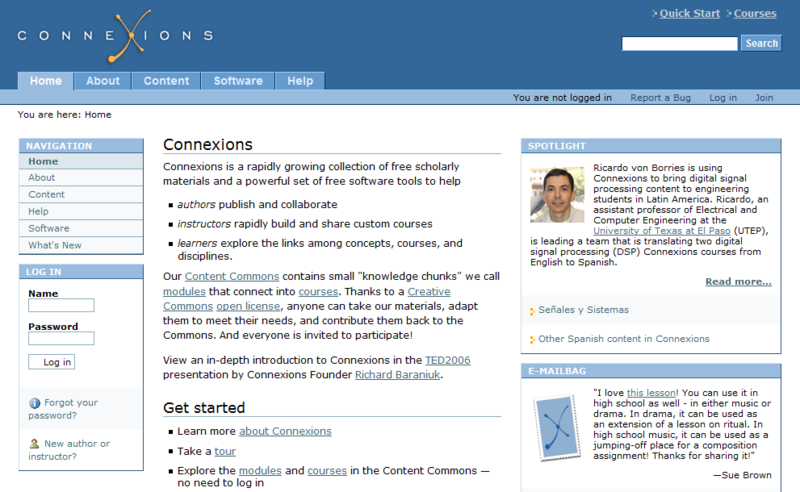 Connexions, my primary employer, needed a simple yet attractive website for its associated consortium members and prospective members, one that could grow as needed without redesign. 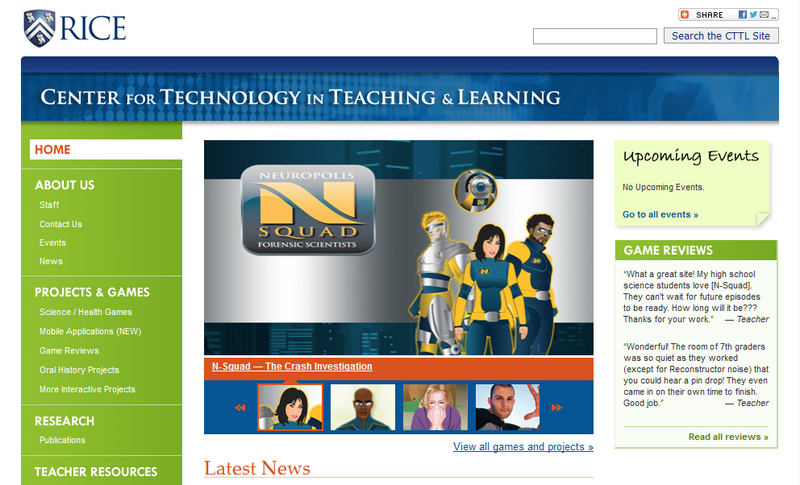 I designed and built the site in roughly a week, with a simple backend for logging in provided by Ross Reedstrom. The goal was to make a simple and clean website, that would be flexible enough for changes as needed. 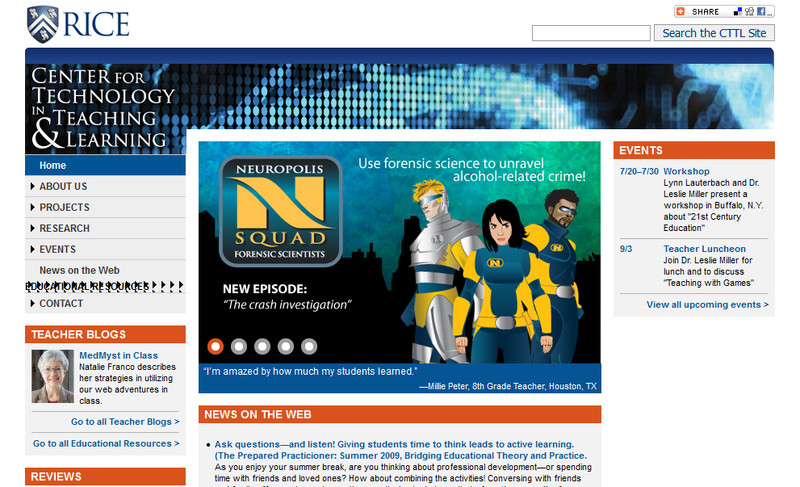 I created the original design and put the site together in about a week. 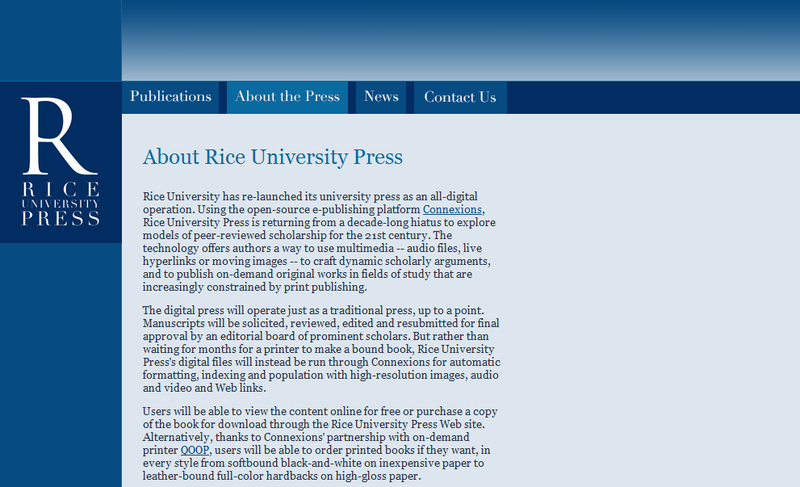 During the years when Rice University Press made a revival, I was tasked with designing their website. 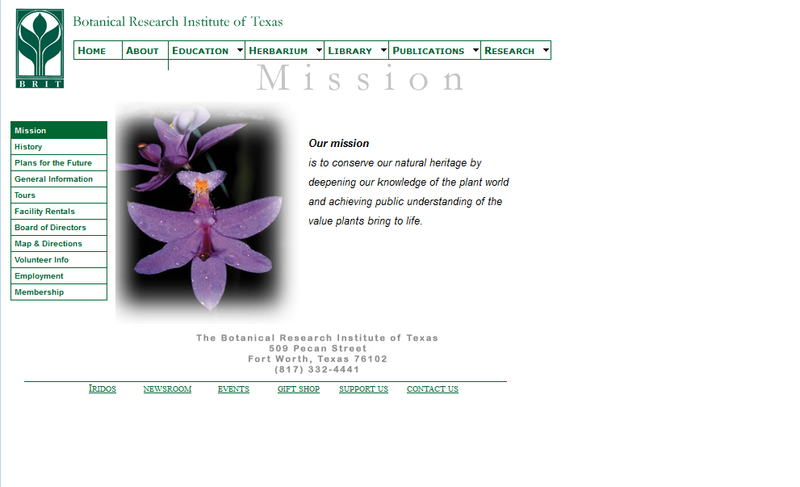 I sought to make an elegant design that was in keeping with Rice's branding while remaining distinctive. 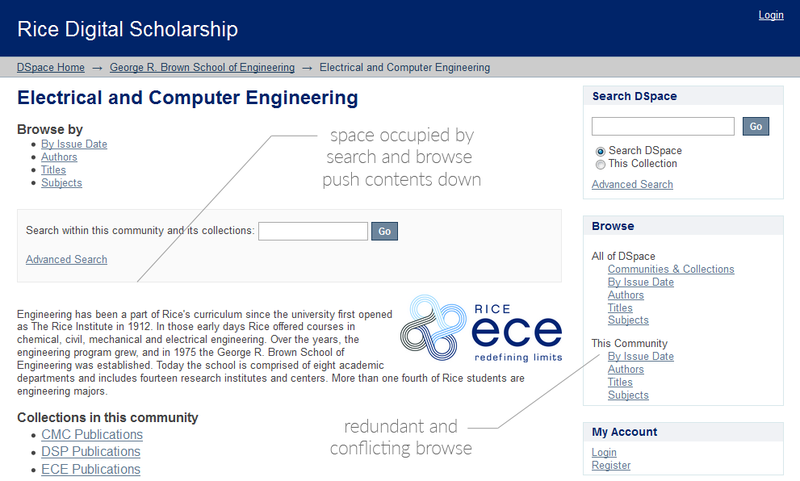 The design took cues from Rice University's branding while also setting itself apart. The general design was also meant to reflect the covers of some of its publications. This script allowed users to select their previously used tags from a dropdown, a long-requested feature to make tagging more internally consistent. 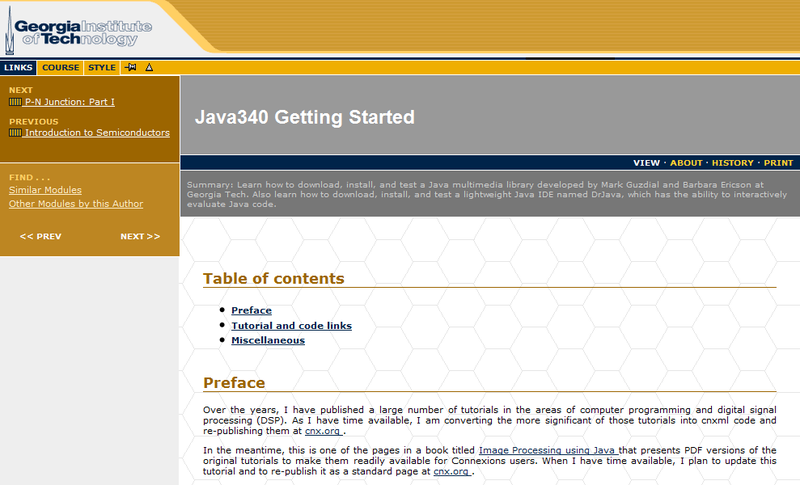 It's one of my proudest scripts, because not only did it serve as proof-of-concept for later incorporation into the site for all users, it also required learning about things I hadn't had much experience with up to that point, such as XMLHttpRequest/Ajax, localStorage, jQueryUI's autocomplete, regular expressions, and performance testing. 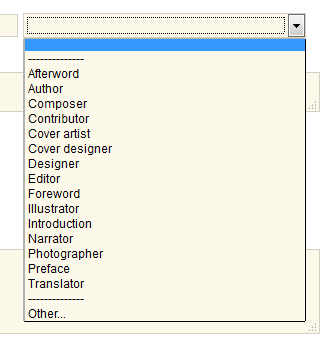 You could choose whether the tags would sort in alphabetical order or by frequency of use, and the browser would remember your choice. 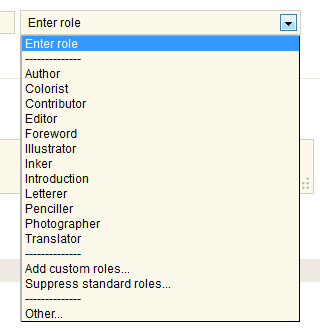 This is how the dropdown appears to all users, no matter how many times you've added one of those "Other..." types. Somebody who is, say, cataloging their comic book collection can now change the list to look like this. LibraryThing's social forums have a built-in mechanism for quickly linking to previous posts, but when you click on them, you tend to lose your place. This script makes a small copy of that referred message and reproduces it in a tooltip right where you are. If users hover over the link that goes back to a previous message, that previous message gets duplicated in place. 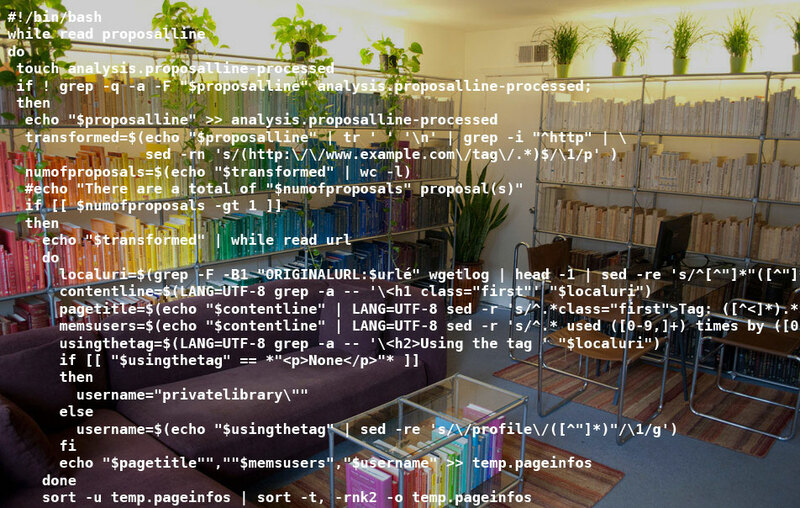 Not all of my scripts are for LibraryThing. This one I made after some frustration with Amazon removing the names of some items from my Wishlists. Now I can just click on the new "Export" button and quickly save a local copy of the list. 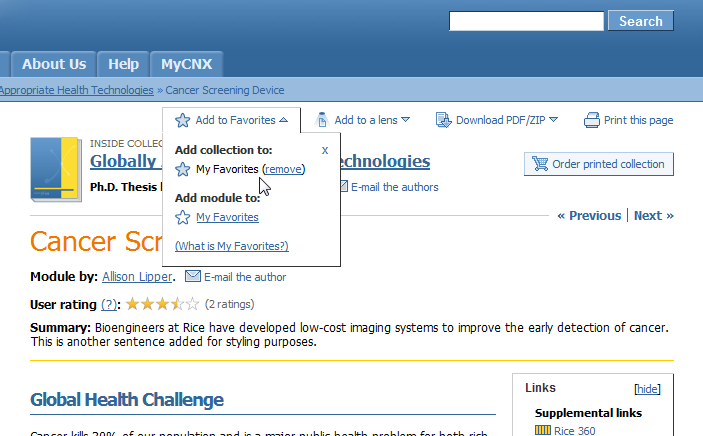 This script adds a new button to Amazon Wishlists to export the list as a TSV file. Nor are all of my scripts user scripts. My first shell script was used to add up how much money I had wasted spent on books over the years, and display a histogram of the distribution. You can see the full script on GitHub. Thank goodness so many were found in the clearance section (I love Half Price Books). Translate your conceptual goals into digital deliverables by building intuitive interfaces made strong by clean, robust code and aesthetic visuals. I will proactively seek out the appropriate solution to each problem, be it with an Illustrator design, a Bash script, or anything in between, to give you a successful product and satisfying user experience. 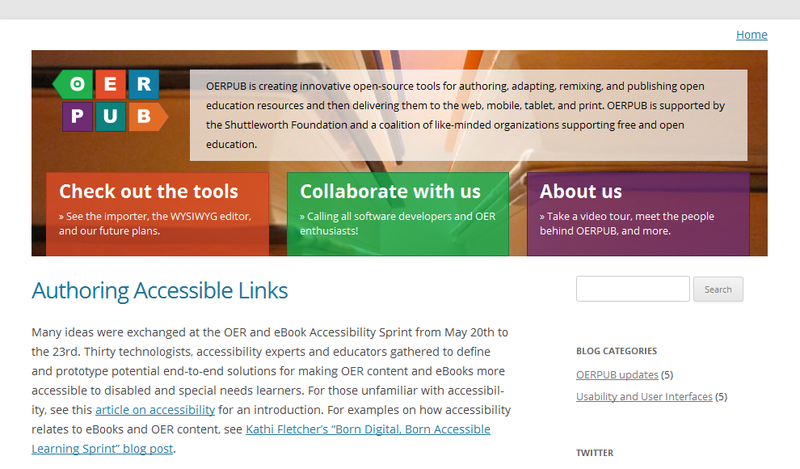 Part of my goal for this site was to learn some new things, brush up on old, and try out some new open-source libraries. To that end, I coded the CSS in Sass, I managed and committed the code with Git commands (pushed to BitBucket and directly to my web host sometimes via Cygwin and other times in Ubuntu via VirtualBox), learned more about creating and animating SVG images, used Jekyll (and other assorted Ruby gems) to make the site bilingual without duplicating the code, and stretched some responsive muscles for a graceful mobile viewing experience. 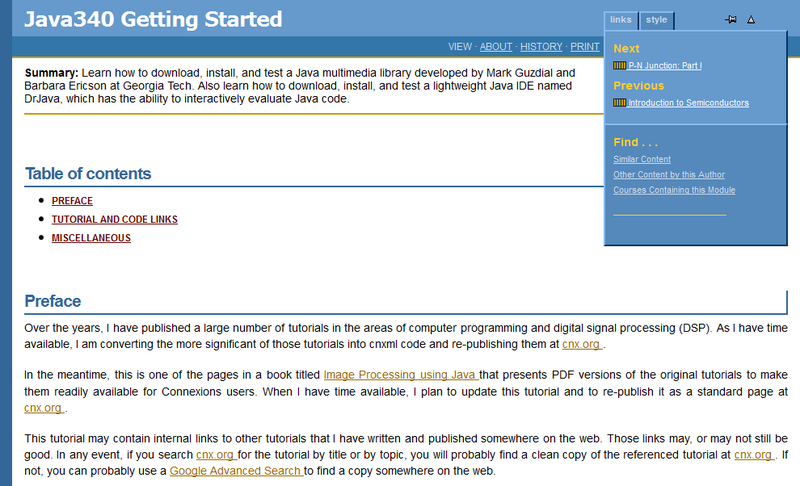 Except where noted (below and in comments), everything was coded by yours truly from scratch. Oops, looks like there was a problem with the form. Sorry about that. Try writing me instead at max@maxwell.fyi.